I hinted at it in last night’s Instagram, and, drumroll please… it’s here! My guide to the 20 best pieces of the Shopbop 2017 sale! For those of you who are wondering what the heck this sale is and why everyone’s freaking out about it, let me explain. A few times a year, Shopbop puts nearly every single item on their site on sale based on a tiered spending level system. What is the code? 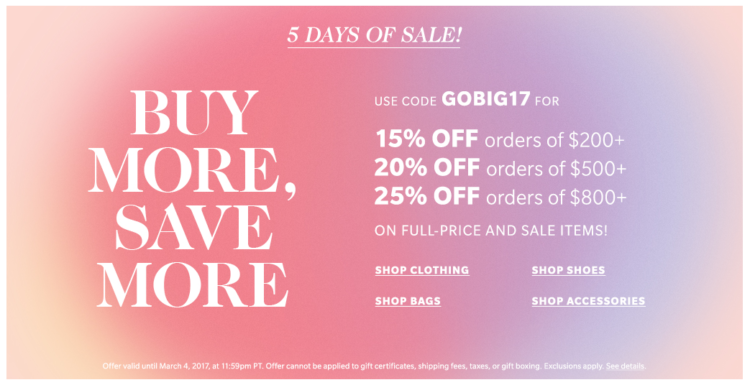 GOBIG17 What are the spending breakdowns? Check them out below! If you’re anything like me, you may be thinking “Ok Kate… spending $200 is nowhere close to the definition of SALE in my book.” Girl, I get ya! Let me explain. This sale includes new-in spring and summer pieces that you won’t find on sale at any other time! Take these new Tory Burcy sandals for example, or these designer jeans! I personally use the sale to purchase a couple of beautiful, quality, higher-ticket dresses that I wear to weddings and events throughout the remainder of the year. A word of advice? Combine your order with your mama or best friend so you can hit the highest discount bracket possible! Back to the guide… I did have to narrow my guide down from the huge selection (like, we’re talking almost the entire site) to just clothing pieces, but don’t let me stop you. You’ll find a ton of amazing sales on shoes HERE, bags HERE and accessories HERE! Happy shopping, everyone! Let me know your favorite find in the comments! One fun splurge I just ordered? These cuties that I’ve had my eye on for weeks! Love how you organized these picks by color, so cute :) I can’t get enough of this sale! I seriously keep finding more and more things I want haha!